← Reaching Limits to Growth: What Should our Response Be? Steve Kopits recently gave a presentation explaining our current predicament: the cost of oil extraction has been rising rapidly (10.9% per year) but oil prices have been flat. Major oil companies are finding their profits squeezed, and have recently announced plans to sell off part of their assets in order to have funds to pay their dividends. Such an approach is likely to lead to an eventual drop in oil production. I have talked about similar points previously (here and here), but Kopits adds some additional perspectives which he has given me permission to share with my readers. I encourage readers to watch the original hour-long presentation at Columbia University, if they have the time. 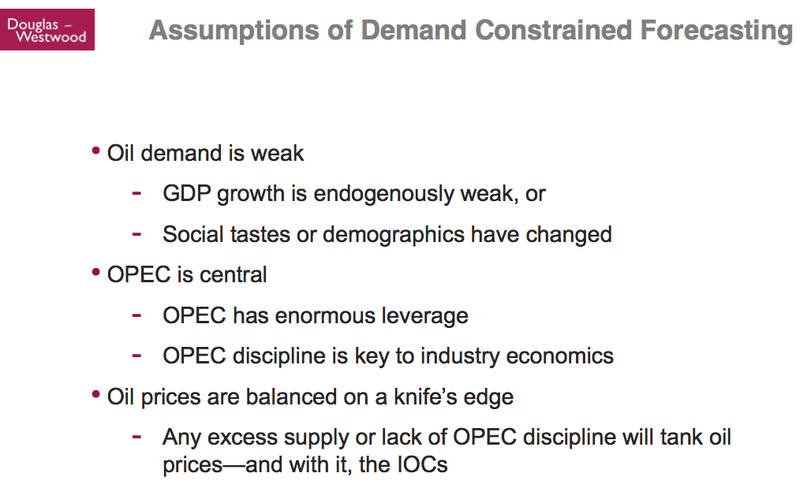 Thus, it is the demand constrained view of forecasting that gives rise to the view that OPEC (Organization of Petroleum Exporting Nations) has enormous leverage. The assumption is made that OPEC can add or subtract as much supply as much as it chooses. Kopits provides evidence that in fact the Demand view is no longer applicable today, so this whole story is wrong. One piece of evidence that the Demand Model is wrong is the fact that world crude oil (including lease condensate) production has been nearly flat since 2004, in a period when China and other growing Eastern economies have been trying to motorize. In comparison, there was a rise of 2.7% per year, when the West, with a similar population, was trying to motorize. Kopits points out that China’s big source of oil supply has been US main street: China bids oil supply away from United States, to satisfy its needs. This is the way that markets have made oil available to China, when world supply is not rising much. It is part of the reason that oil prices have risen. Another piece of evidence that the Demand Model is wrong relates to the assumption that social tastes have simply changed, leading to a drop in US oil consumption. 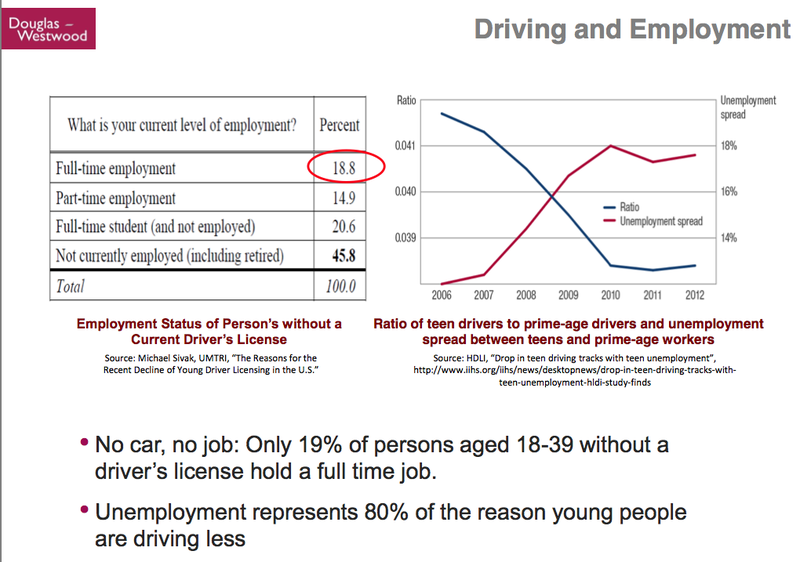 Kopits shows the following chart, indicating that the major reason that young people don’t have cars is because they don’t have full-time jobs. Kopits makes a comparison of the role of oil in GDP growth to the role of water in plant growth in the desert. Without oil, there is less GDP growth, just as without water, a desert is starved for the element it needs for plant growth. 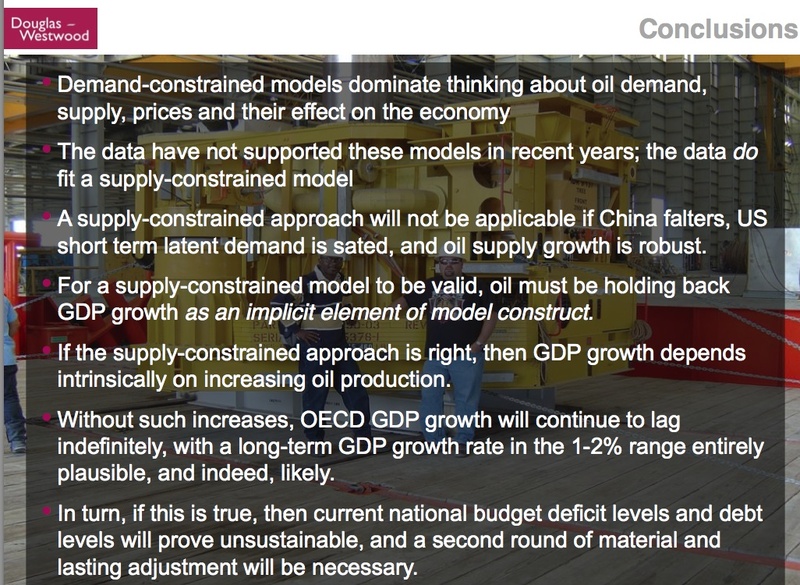 Lack of oil can considered a binding constraint on GDP growth. (Labor availability might be a constraint, but it wouldn’t be a binding constraint, because there are plenty of unemployed people who might work if demand ramped up.) When more oil is available at a slightly lower price, it is quickly absorbed by markets. “Supply Growth” is the limiting factor in recent years, because the amount of extraction is rising only slowly due to geological constraints and the number of users has risen to the point that there is a shortage. 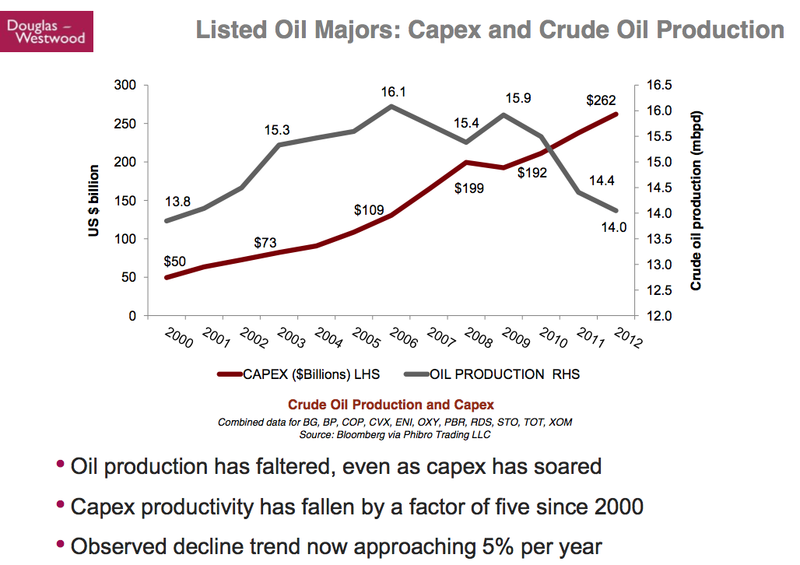 A person would normally expect that crude oil production would rise as Capex rises, but Kopits shows that in fact since 2006, Capex has continued to rise, but crude oil production has fallen. The above information is worldwide, not just for the US. At some point a person might expect companies to start getting frustrated–they are spending more and more, but not getting very far in extracting oil. Now why is that? The reason is that in a Demand constrained model for those of you who took economics–price equals marginal cost. Right? So if my costs are going up, the price will also go up. Right? That is a Demand constrained model. So if it costs me more to get oil, it is no big deal, the market will recognize that at some point, in a Demand constrained model. Not in a Supply constrained model! In a Supply constrained model, the price goes up to a price that is very similar to the monopoly price, after which you really can’t raise it, because that marginal consumer would rather do with less than pay more. They will not recognize [pay] your marginal cost. In that model, you get to a price, and after that price, there is significant resistance from the consumer to moving up off of that price. That is the “Supply Constrained Price.” If your costs continue to come up underneath you, the consumer won’t recognize it. The rapidly growing Capex forecast is implicitly a Demand constrained forecast. It says, sure Capex can go up to a trillion dollars a year. We can spend a trillion dollars a year looking for oil and gas. The global economy will accept that. I quote this because I am not sure I have explained the situation exactly that way. I perhaps have said that demand had to be connected to what consumers could afford. Wages don’t magically go up by themselves (even though economists think they can). 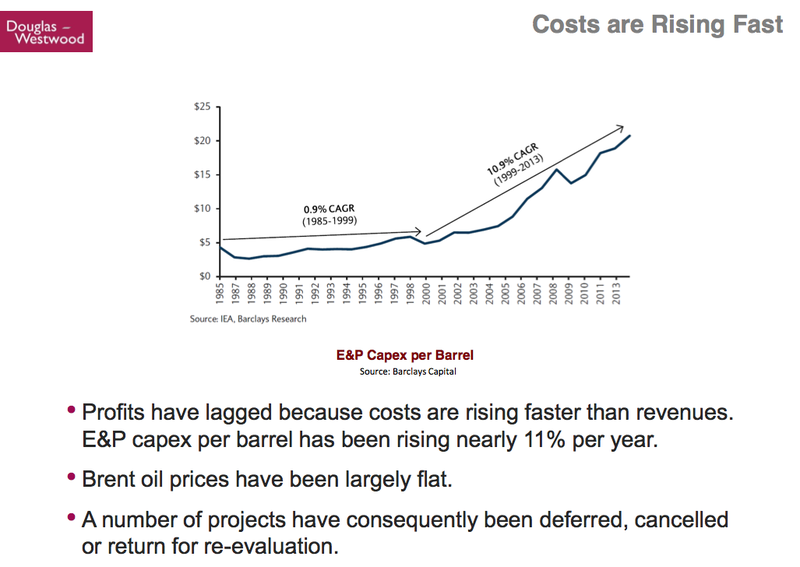 According to Koptis, the cost of oil extraction has in recent years been rising at 10.9% per year since 1999. (CAGR means “compound annual growth rate”). Oil prices have been flat at the same time. On the above chart, “E&P Capex per barrel” is pretty much the same type of expenses as shown on the previous two charts. E&P means Exploration and Production. 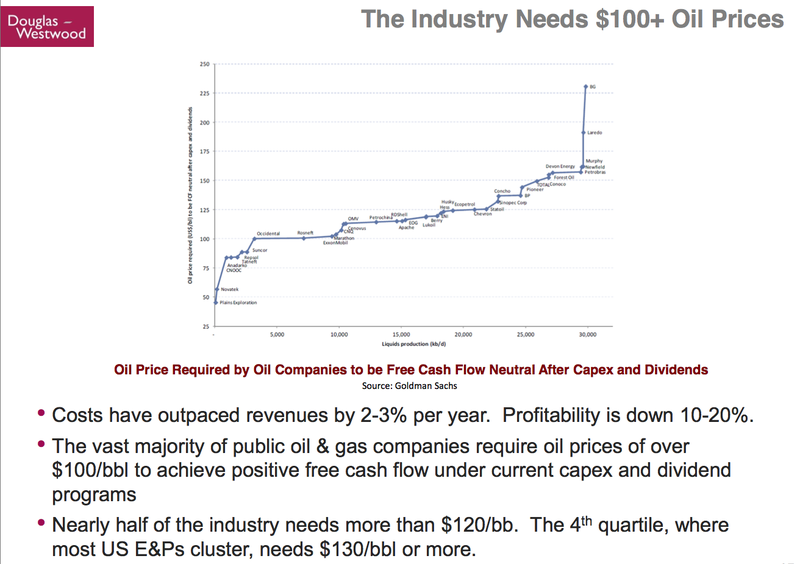 Kopits explains that the industry needs prices of over $100 barrel. The version of the chart I have up is too small to read the names of individual companies. If you would like a chart with bigger names, you can download the original presentation. 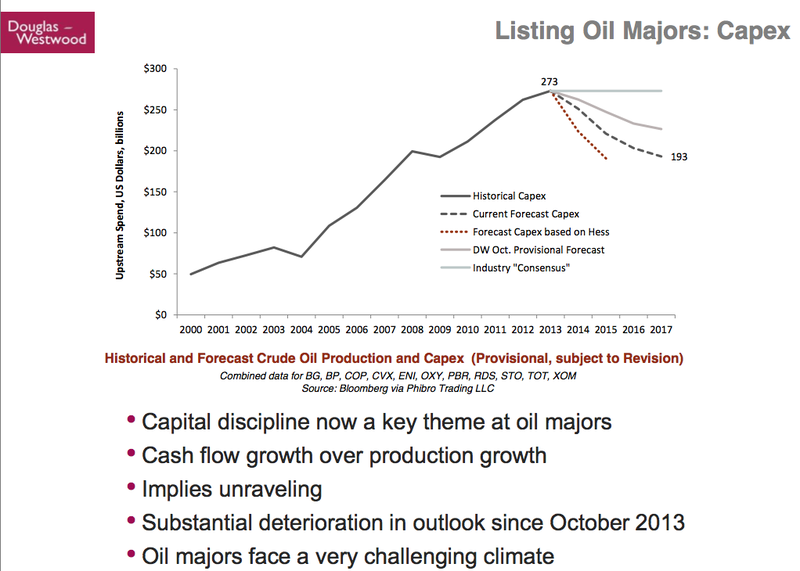 Historically, oil companies have used a discounted cash flow approach to figure out whether over the long term, pricing for a particular field will be profitable. Unfortunately, this “standard” approach has not been working well recently. Expenses have been escalating too rapidly, and there have been too many new drilling sites producing below expectation. What Kopits shows on the above slide is the prices that companies need on different basis–a “cash flow” basis–so that each year companies have enough money to pay today’s capital expenditures, plus today’s expenses, plus today’s dividends. The reason for using the cash flow approach is because companies have found themselves coming up short: they find that after they have paid capital expenditures and other expenditures such as taxes, they don’t have enough money left to pay dividends, unless they borrow money or sell off assets. Oil companies need to pay dividends because pension plans and other buyers of oil company stocks expect to receive regular dividends in payment for their equity investment. The dividends are important to pension plans. 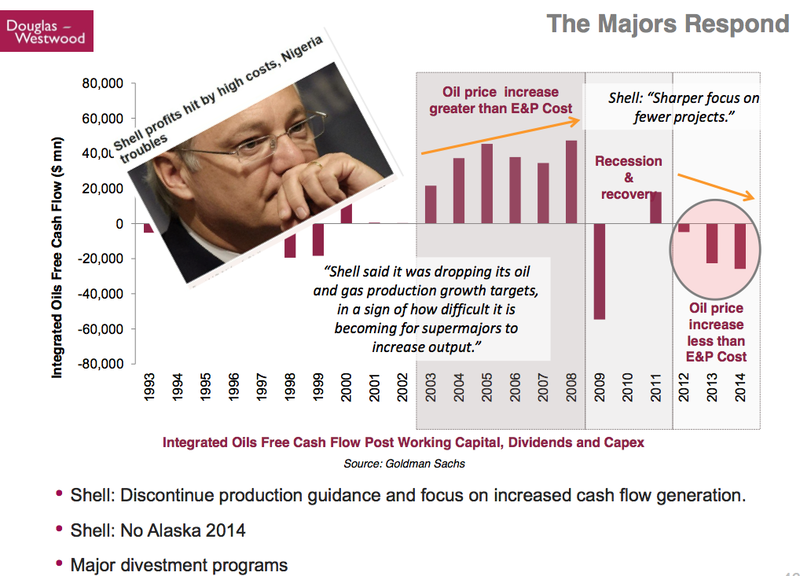 In the slide below, Kopits shows how Shell oil is responding to the poor cash flow situation of the major oil companies, based on recent announcements. Basically, Shell is cutting back. It no longer is going to tell investors how much it plans to produce in the future. Instead, it will focus on generating cash flow, at least partly by selling off existing programs. In fact, Kopits reports that all of the major oil companies are reporting divestment programs. Does selling assets really solve the oil companies’ problems? What the oil companies would really like to do is raise their prices, but they can’t do that, because they don’t set prices, the market does–and the prices aren’t high enough. And the oil companies really can’t cut costs. So instead, they sell assets to pay dividends, or perhaps just to get out of the business. But is this sustainable? 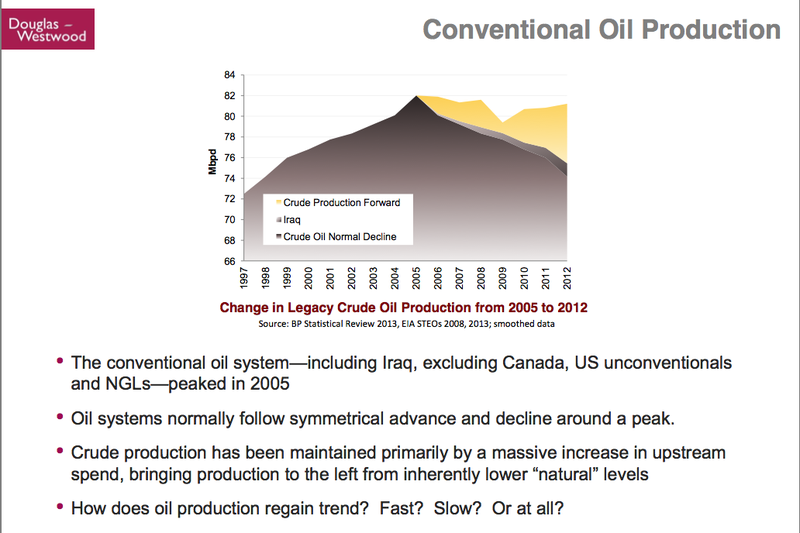 The above slide shows that conventional oil production peaked in 2005. The top line is total conventional oil production (calculated as world oil production, less natural gas liquids, and less US shale and other unconventional, and less Canadian oil sands). To get his estimate of “Crude Oil Normal Decline,” Kopits uses the mirror image of the rise in conventional oil production prior to 2005. He also shows a separate item for the rise in oil production from Iraq since 2005. 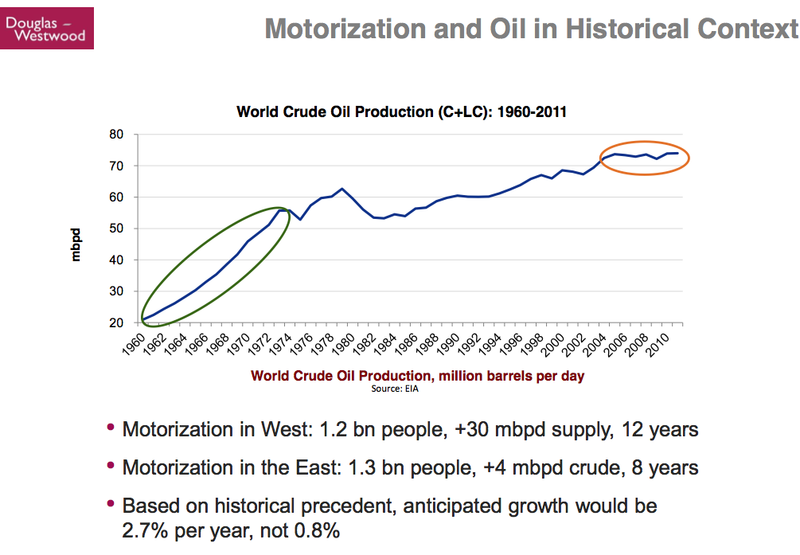 The yellow portion called “crude production forward” is then the top line, less the other two items. It has taken $2.5 trillion to add this new yellow block. Now this strategy has run its course (based on the bad results companies are reporting from recent drilling), so what will oil companies do now? Above, Kopits shows evidence that many companies in recent months have been cutting back budgets. These are big reductions–billions and billions of dollars. On the above chart, Kopits tries to estimate the shape of the downslope in capital expenditures. This chart isn’t for all companies. It excludes the smaller companies, and it excludes the National oil companies, so it is about one-third of the market. The gray horizontal line at the top is the industry consensus back in October. 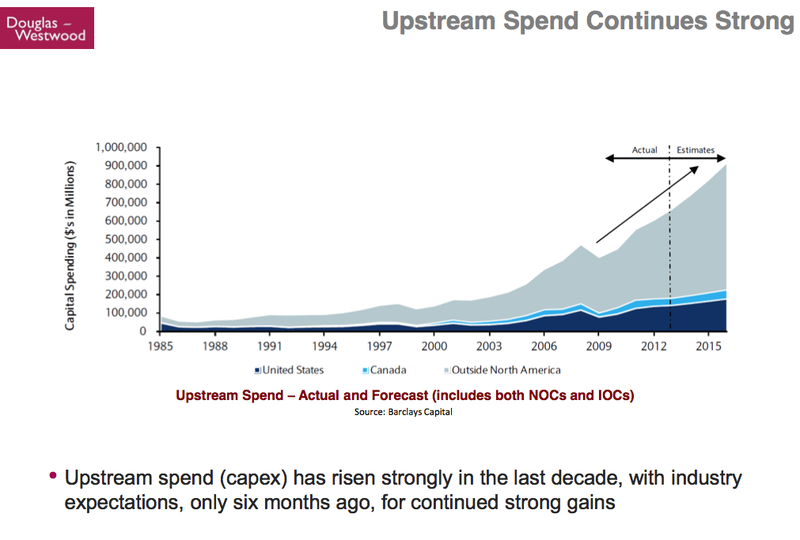 The other lines represent more recent estimates of how Capex is declining. The steepest decline is the forecast based on Hess’s announcement. The next steepest (the dotted gray line) is the forecast based on Shell’s cutback. The cutback for the part of the market not shown in the chart is likely to be different. In his view, the maximum sustainable increase in efficiency is 2.5% in non-recessions, but a more normal increase is 1% per year. At current oil supply growth levels, OECD GDP growth is capped at 1% to 2%. 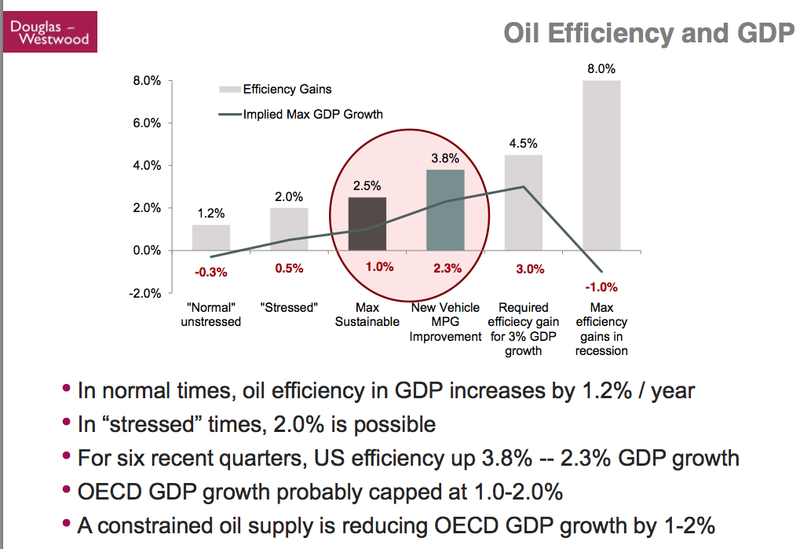 The effect of constrained oil supply is reducing OECD GDP growth by 1% to 2%. While demand constrained models dominate thinking, in fact, a supply constrained model is more appropriate in recent years. We seem to be short of oil. Whenever there is extra oil on the market, it is quickly soaked up. Oil prices have not collapsed. No one is nervous about a price collapse. China recently has been putting little price pressure on the market–its demand is recently less high. Kopits thinks China will eventually return to the market, and put price pressure on oil prices. Thus, oil price pressures are likely to return at some point. An obvious point, which I thought I heard when I listened to the presentation the first time, but didn’t hear the second time is, “Who will buy all of these assets on the market, and at what price?” China would seem to be a likely buyer, if one is to be found. But when several companies want to sell assets at the same time, a person wonders what prices will be available. The new strategy is, in effect, maintaining dividends by returning part of capital. It is clearly not a very sustainable strategy. It will take a while for these cut-backs in Capex expenditures to find their way through to oil output, but it could very well start in a year or two. This is disturbing. In this talk, it looks like lack of sufficient investment is poised to bring the system down. That is basically the expected limit under Limits to Growth. In theory, if an expansion of China’s oil demand does bring oil prices up again, it could in theory encourage an increase in drilling activity. But it is doubtful that economies could withstand the high prices–they are already having problems at current price levels, considering the continued need for Quantitative Easing to keep interest rates low. Mr Hockey said reaching the goal would require increasing investment but that it could create “tens of millions of new jobs”. The cutback in investment by oil companies is working precisely in the wrong direction. 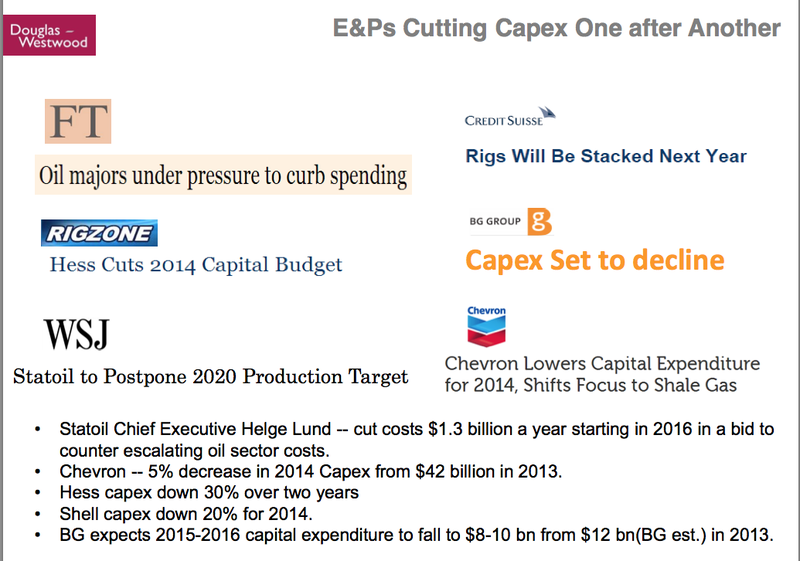 If these cutbacks act to cut future oil extraction, it will bring down growth further. This entry was posted in News Related Post and tagged call on OPEC, oil extraction, oil investment, Steven Kopits. Bookmark the permalink. Unless of course the government is planning to turn the police on the people when the SHTF. Thanks! If there are buyers, theoretically smaller companies could develop this oil–but that is a big if. Otherwise, production will drop more, and tax revenue will be down and well. Gas production will go down as well. Pingback: What’s the point of martial arts? An essay. – Sing. Dance. Fight.